Want to know whether that buzz from your silenced iPhone is a call from your spouse, boss, or babysitter, and not just some random cold call? 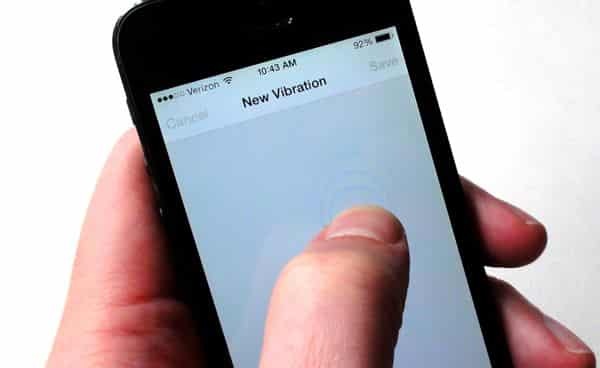 Good news: your iPhone will let you create custom vibration “patterns” that you can assign to any contact you choose. iOS 7 already comes with a few preset iPhone vibrations, ranging from Heartbeat (buzz-buzz, buzz-buzz) to S.O.S. (three short buzzes, three long buzzes, and three short buzzes again), and you can assign those patterns to specific contacts in your address book (more on that in a moment). But you can also “record” your own personalized vibration patterns by tapping out the buzzes on your iPhone’s touchscreen. You can select a saved custom vibration—or create a new one—for a specific contact. First, launch the Phone app, tap the Contacts tab at the bottom of the screen, then pick your favorite contact. Now, ready to create your own vibration pattern? If so, time to start tapping. You can tap rapidly to create little “dot-dot-dots” of buzzes, or tap and hold for a long, sustained buzz. All done? Tap Stop, then tap Play to, um…”feel” your new vibration. You can also tap Record to try again. Happy with your creation? Tap Save, give your vibration a name, and then tap Save again. You should now be back on the “Vibration” setting for the contact in question, and you’ll notice that your new vibration (under the Custom heading) has a checkmark next to it. Tap the blue Done button in the top-left corner of the page. From now on, whenever your contact gives you a ring, your silenced iPhone will “play” the vibration you just created. Want your new custom vibration to buzz whenever your contact sends you a text message? Go back to the contact, tap Edit, scroll down to the “Text Tone” section, tap “Vibration,” and choose your vibration pattern under the “Custom” heading. You can also create a brand-new vibration just for text alerts, if you’re feeling ambitious. Once you save a custom vibration, it’ll often be available as an alert option for other apps and events. For example, you can set a custom vibration to buzz when you get a calendar alert by tapping Settings, Notifications, Calendar, Calendar Alerts, Vibration. Scroll down to the Custom section, then pick one of your previously saved custom vibrations from the list, or tap Create New Vibration. Note: This updated and revised tip was first published in January 2012.
iOS tip: Can you create your own “Groups” in the Contacts app?